For a long time, I delayed upgrading from Windows 8.1 to Windows 10 because I didn’t like many of the features and “improvements” that were included with Microsoft’s current OS. I eventually had to upgrade and have found many tweaks that can be made to Windows 10 that cut out the garbage and make it more Windows 8.1 and 7. This article is the first of several which will teach you how to do the same. In years past, I installed a fresh copy of Windows and that was it. There were no bloatware programs installed by a PC manufacturer and there definitely weren’t any included on Windows. With Windows 10 that’s no longer the case. Microsoft includes all sorts of trialware, apps and other nuisances which I would never want. The kicker is that many of them cannot be removed by right-clicking the app and clicking “Uninstall”. The Get Office, Get Skype, Get Started, Microsoft Solitaire Collection, Money, News, Phone Companion, and Sports apps can all be removed by right clicking them and then clicking “Uninstall”. 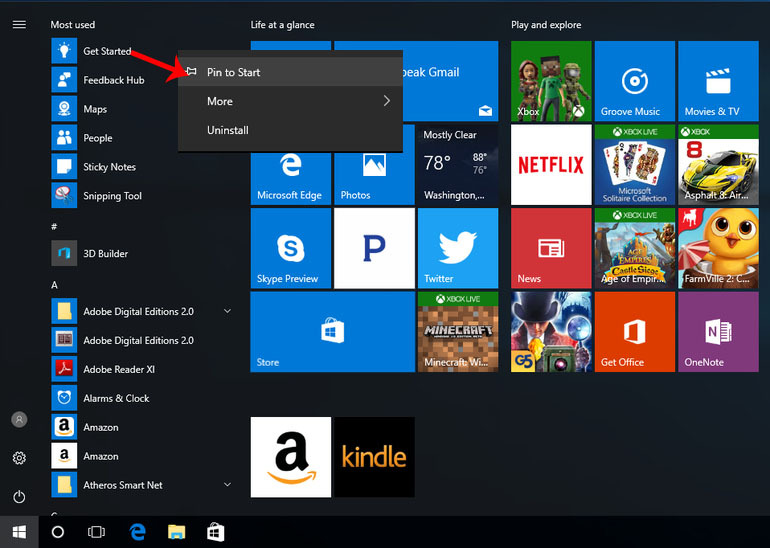 If Windows 10 downloads additional apps such as Candy Crush, FarmVille, TripAdvisor, Netflix, and Pandora, these too can be removed by clicking Uninstall. There are many more that cannot be so easily removed but there is a way to remove them by using Windows PowerShell. To use the following commands, you will need to open a PowerShell instance as an administrator. To get there, right-click on the Star menu and go to Windows PowerShell (admin). Click “Yes” when Windows prompts you if you want to allow the app to make changes. Copy a command in a shaded box below and paste the code inside the PowerShell window. Above each box is a description of what you are removing. This app can’t be removed. Keep in mind that a major Windows feature update may re-install these apps upon its installation. You may want to bookmark this page and the included Powershell commands for later reference if that occurs.